Last month I looked around my room…and I realized how much navy blue there was. Everything, and I mean everything, was navy blue and it was a new year and time for a change! 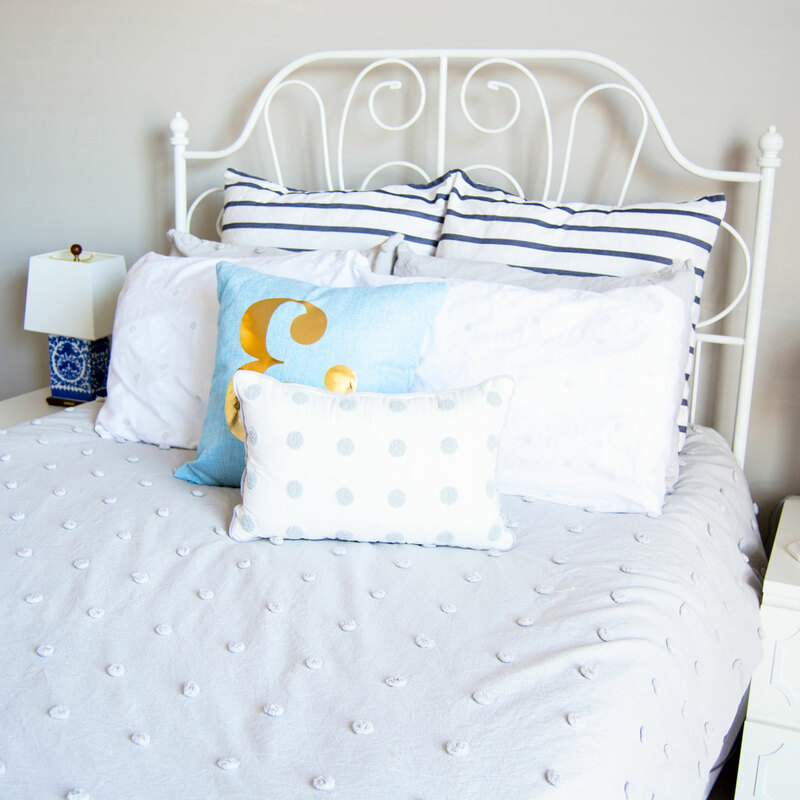 I fell in love with this gray polka dot Kate Spade bedding on Amazon…but, the thrifty side of me can’t throw down that cash just for a bedding set! I gave myself a budget of $150 to get a new duvet set, sheet set, and pillows to complete the new look. I ended up finding the Kay Duvet Cover Set at Target which came with a gray swiss dot duvet cover plus decorative shams and pillows. It’s priced at around $93, but I got mine 20% off during a sale which made it a steal! One of the reasons why I really liked this set was it came with two decorative shams, plus two decorative pillows. I purchased a new cover for the square pillow because I felt like it was too much gray, and made a gold ampersand on my friend’s Circuit to iron on top! I previously had Euro shams, for which I found the striped Kate Spade pillow shams at Home Goods for $6 each. I completed everything with a set of Kate Spade polka dot sheets that I also scored at Home Goods for just $40! You can easily find polka dot sheets just about anywhere, I was just really excited to find a gray set that perfectly matched my comforter. If you’re at all into the “Kate Spade look” and are looking for some alternative bedding options, I highly recommend checking out Home Goods, first. I’ve found so many deals on actual Kate Spade home products over the years that it’s worth checking it out.